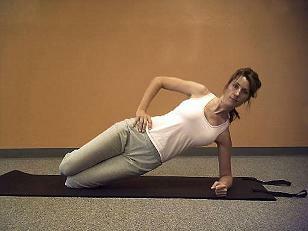 Doing back exercises at home is easy when you use the Pilates sequence of exercising. The beauty of Pilates for back strength is that it helps to stabilize the core muscles that support the back while simultaneously stretching and strengthening the muscles of the spine. I have felt the difference when doing Pilates and not. When doing Pilates exercises I can shovel snow, dig holes, and do other heavy outdoor and indoor work without pain and the worry of throwing out my back after. You don't have to spend hours working on your back to make it stronger and more flexible. You just have to be consistent! I'll show you some of my favorite back exercises at home using the Pilates method of exercising. This Back Stretching Exercise not only feels great to open and stretch the vertebra in the spine, but it also helps with your posture and a longer tighter waist. Begin lying on your stomach with your hands under your shoulders. As you inhale begin to peel your head, chest, then ribs, and waist up off the mat as shown. Press up only as high as you feel no pain, you can just press to your elbows to modify. Try turning your head to stretch at the top. Take a few breaths there pulling your belly button deeper into your spine and sliding your shoulder blades down your back. Exhale to peel back down. Repeat for 4-6 repetitions. This Back Strengthening Exercise works not only the upper back, but also the deeper muscles of the transverse abdominals and the erector spinae. Begin lying on your stomach with your hands clasped high on your upper back or at your side if you aren't able to clasp them. Hollow your pelvis and engage the abdomen by pressing your pubic bone gently into the mat. Inhale as you extend your legs, head, and chest up off the mat reaching your arms up off your back and sliding your shoulders down your back. Hold for a few seconds and then exhale as you lower. The Kneeling Balance Exercise is a great way to balance the muscles on both sides of your spine. Begin kneeling on your hands and knees with hands under your shoulders and knees under your hips. 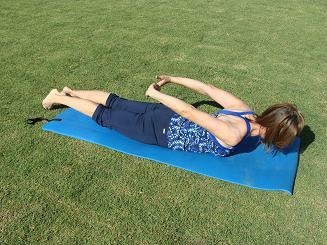 Inhale as you tighten your core muscles and extend one leg up just parallel to the floor, then extend the opposite arm. Lift your chest and look out there like a bird dog pointing to the bird. Exhale as you bring the leg and arm back to start and then repeat on the other side for 4-8 repetitions on each side. The Pilates Side Plank Exercise you don't want to leave out as one of your back exercises at home as it helps to strengthen our oblique muscles along the sides of the spine and at the waist. Begin sitting on one hip with your legs folded and leaning into your hand or elbow just angled from your shoulder. Inhale as you tighten the muscles at the waist lengthening your body and lifting your hips up at the angle shown. Hold for one or two breath cycles and lower. Repeat on both sides for 4-8 repetitions. You may progress this Pilates for back exercise into lengthening your legs all the way out and pressing up onto a straight arm as you are able. 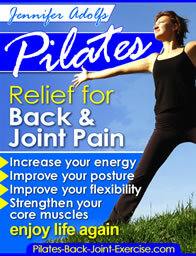 Check out my Pilates ebook to get a whole 3 level progression of Pilates back exercises at home here.